Blackstone Rubber Industries Pvt. Ltd. is one of the leading names when it comes to the best tyres, retreading and other related products. With the techonology advancement, OTR Radial Tyres came into use. Our company was first in India to install OTR Radial Tyre Retreading facility of one particular size of Tyre and have added the facilities for other sizes of OTR Radial Tyres too. Always keeping in mind our company’s vision , we are upgrading our product portfolio with new quality products at affordable price. Started with the one machine, today company has several machines covering wide range of sizes of OTR tyres. Viz. 12.00X24, 13.00X24, 14.00X20, 14.00X24/25, 16.00X25, 18.00X25, 23.5X25, 18.00X33, 21.00X35, 29.5X29. Our group has not only achieved expertise in offering tyres of all major brands manufacture retread materials for mould-cure and precure operations, but also in marketing tyre-service and maintenance tools, accessories and other products. We have become an expert in the domain of manufacturing a large ambit of Tools, Tackles and Machines that is widely used for the maintenance of OTR Tyres. With time, we have also specialised in making Procured Tread Rubber and Tyre Patch manufacturing. Today we are reowned as a manufacturer, exporter and supplier of Nylon Tyre Patches, Radial Tyre Patches, OTR Tyre Patches, Tyre Related Tools, Tire Removal Tool, Retreading Of Tyres, New Tyres, Tubes & Flaps etc. Fabricated by quality tested materials, these products serve the applications with complete satisfaction. The entire range is manufactured using latest technology that has been proved to be the best in the international market. 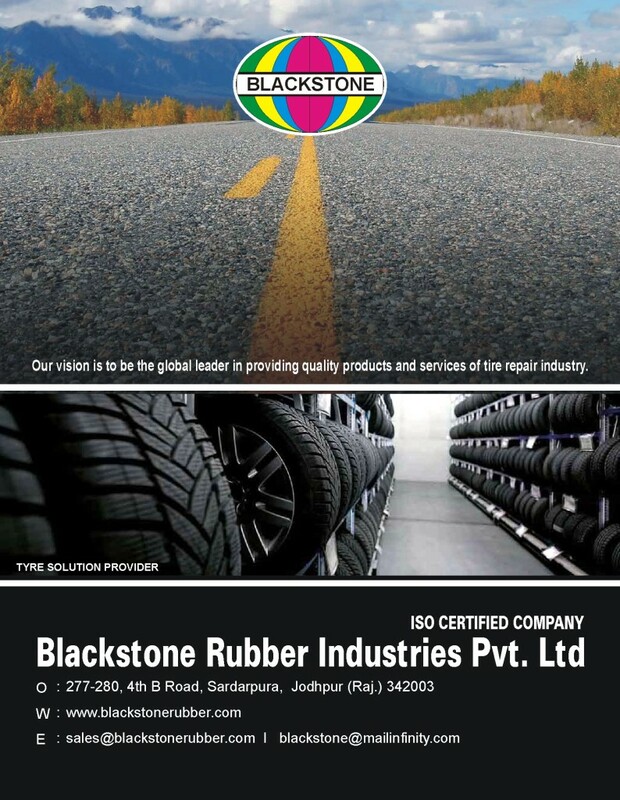 Blackstone is one of the FIRST companies in India to obtain ISO 9001 – 2008 Certification for the Standardisation in “RETREADING & VULCANISING OF OFF THE ROAD / EARTH MOVER TYRES, MANUFACTURING OF HOT TREAD RUBBER / PRE-CURED TREAD RUBBER, CUSHION COMPOUND, TREAD COMPOUND, CROSS PLY PATCHES, RADIAL PATCHES & SUPPLY OF TYRES, TUBES, FLAPS, TOOLS & TACKLES”. A RECOGNITION FOR QUALITY & DEPENDABLE SERVICE. Our R & D team works continuously to improve quality and offer the best retreading, new tyres, tubes, Flaps, tools & Tackles, etc. By offering high quality products of major brands, we enable you save precious time as well as money. We have the record of serving more than 1000 items in the domain of tyre care, repair and service. With our high end services, we have not only earned the trust of limited and private players but also of varied leading State Transporters such as H.R.T.C, R.S.R.T.C, O.S.R.T.C, T.N.S.T.C, N.B.S.T.C KERALA, S.R.T.C etc.